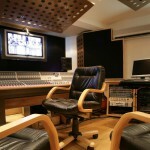 Ten21 Recording Studios - great for Drums and Everything. Ten21 is a recording studio near Maidstone in Kent (UK), and is owned and run by Sean Kenny – friends with Niall Acott of NJA.me.uk. They do AMAZING drum recording. Amazing and fast. In Sean’s words: “Ten21 is a state-of-the-art, multifunctional, professional digital recording studio offering a comprehensive range of recording studio services”. Today I popped to visit Niall Acott down Maidstone way, and we recorded the drums for one of his tunes – “Faith Forever” – at Ten21 Studios.